To act as he did required great confidence in Christ and in his skill to interpret both Scripture and the times. To sit in a group where Melchoir Hoffman (1495-1543) teaches from the Book of Revelation would be fascinating. If anyone believed in the soon return of Jesus, it was Hoffman! To act as he did required great confidence in Christ and in his skill to interpret both Scripture and the times. 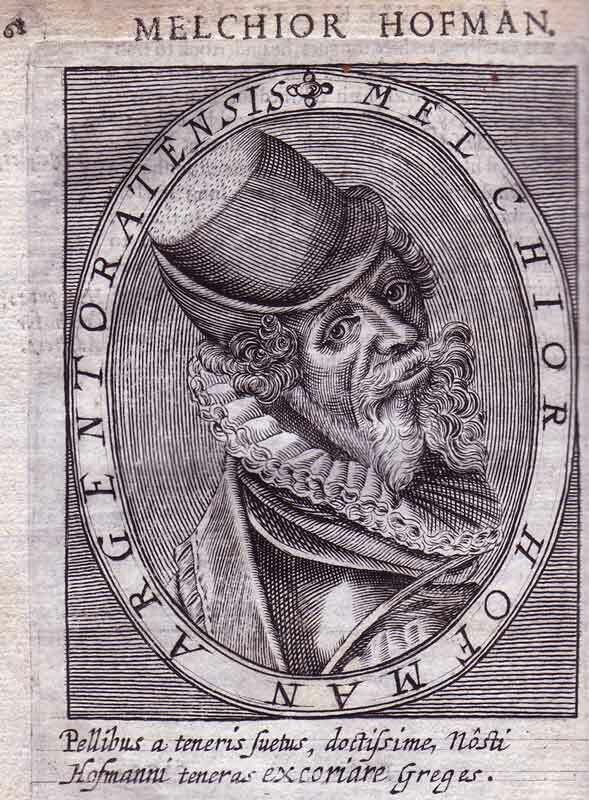 Hoffman was “one of the most dramatic early Anabaptists, responsible for the spread of the movement from South Germany to the North” (H. Hillerbrand). His work and his preaching took him even farther, though, to Sweden and Denmark where he enjoyed brief favour. A dealer in furs with an elementary school education, he was an avid reader and became a keen writer. By 1523 he was a follower of Martin Luther. Early on he held to salvation by grace through faith, holy living, the use of allegory, and milliennialism. During this time he preached and, when authorities questioned his doctrine, some leaders (including Martin Luther) vouched for him. By 1525, however, Hoffman considered himself a prophet, one of the two witnesses spoken of in Rev. 11. He was critical of Lutheran pastors; to him, they minimized the need for holy living. His trade took him to Sweden where he married and had a son. There he preached in the Lutheran church. When the king asked him to resign, he returned to Germany and later went to Denmark. In Denmark he clashed with Luther (who wrote, wanting him to stop preaching till better informed) and Lutheran clergy. The Danish king expelled Hoffman. It was in Sweden that Hoffman wrote three of his many writings, one book of which interprets Daniel 12, explains the gospel, defends preaching by lay people, explores communion and confession, and deals with church authority. Hoffman was baptized on confession of faith in 1530; his next 13 years continued a pattern of service, conflict, and a focus on the Lord’s return. On May 4, 1534, Hoffman asked officials in Strasbourg to imprison him in the tower—so soon did he expect the Lord’s return and his freedom. They agreed, treating him gently at first. On April 15, 1535, Hoffman said the Lord would return in his third year of imprisonment. By May 8, 1539, Hoffman’s face and legs were “greatly swollen.” He asked authorities to “let him out for a month until he feels better, then he would gladly go back.” The authorities “let him out of the hole” while carefully guarded. Former Anabaptists and Reformed leaders visited him, seeking to change his beliefs. Did he recant? This is unclear. At any rate, he was not released. His prison conditions became harsher and his health weakened. Conditions were eased somewhat, but in 1543 he died before the Lord’s return, a victim of the authorities and his folly. What’s a fair assessment of Hoffman? C. Neff and W. O. Packull say this: “Aside from his unbridled fantasy, his arbitrary interpretation of Scripture, and his fanatical view of the end-times, his writings also contain a wealth of sound Christian ideas and sober thoughts.” But what happened to Hoffman’s wife and son? Sources: H. J. Hillerbrand, ed., The Reformation (Baker, repr. 1987); C. Neff and W. O. Packull, “Hoffman, Melchoir” (GAMEO, 1956, 1990); J. C. Wenger, ed., The Complete Writings of Menno Simons (Herald Press, 1956, 1984).